What are coastal plants? Living near the coast is tough. Plants have to withstand strong winds that blow salty water on them, and for those that grow on rocky cliffs, precarious perches with not much soil and have a tendency to crumble away. Coastal plants don't grow with their roots in the sea, unlike mangroves. You can see that they are mostly found with their roots above the high water mark. Although sometimes, their branches and even trunks lean well over the water. These coastal plants come in a wide variety. 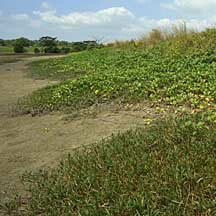 All kinds of trees, shrubs, vines and other plants can be found near shores. These may creep out from level ground to sandy shores. Yet others flourish on steep cliffs and rocky areas near the shores but out of the reach of the highest tides. 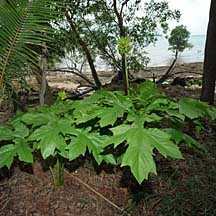 Some of these plants are not exclusive to shores and can also be found elsewhere. Some plants that grow in the back mangroves are called mangrove associates. Role in the habitat: Like other plants, those that grow on the coast provide many services for other plants and animals, including humans. Coastal plants provide food and shelter for birds and other terrestrial creatures. 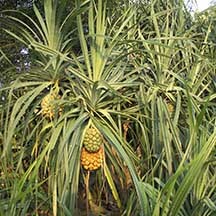 When their leaves and fruits and other parts fall on the shore, these also contribute to nutrients in the marine habitats. One study found that clown anemonefishes find their way to anemones by the smell of the forest leaves in the water. above a natural rocky shore. prickly thickets near the shore. is only found near shores. to the shores in a dense carpet. text index and photo index of mangroves on this site.